Published: Nov. 19, 2017 at 01:42 p.m. 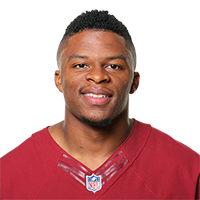 Published: Oct. 23, 2017 at 09:38 p.m.
Washington Redskins running back Chris Thompson walks in for easy TD and gives ball to Eagles fan. Published: Oct. 15, 2017 at 02:34 p.m.
Washington Redskins QB Kirk Cousins hits running back Chris Thompson for a short pass turned into a big gain.